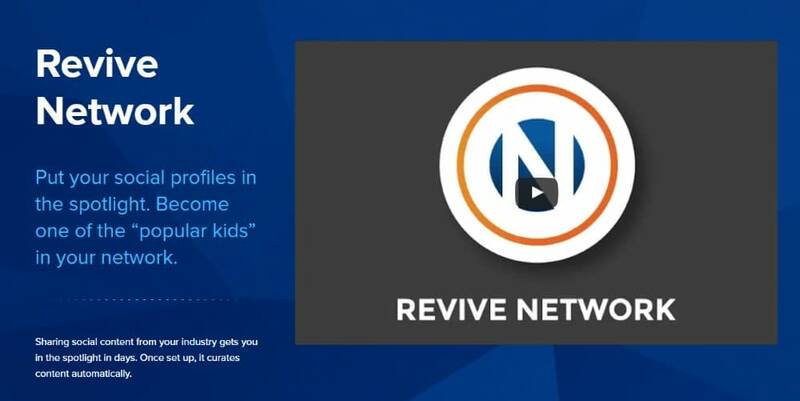 Revive Network is a new member to the family. It allows you to add other people’s site feeds, and then have their content shared through your social profiles (think of it as Revive Old Post but for third-party content). Why would you do that? Well, first, you’re spreading the word out about someone’s great work. Second, they see your referrals in their Google Analytics profiles, which also makes it easier to then reach out to those sites. This can be great for bonding and relationship building. A free plugin that offers tons of social media icons, all of them designed very nicely. This plugin is fully customizable, can be translated into any language, and makes your social icons come to life by using catchy animations and effects. 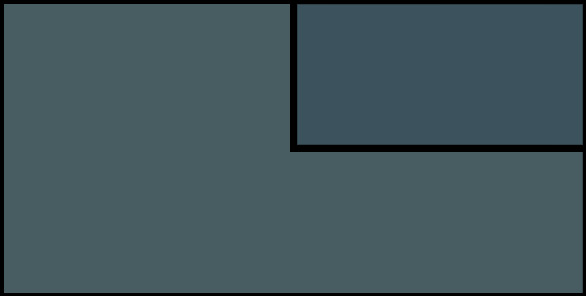 A plugin that lets you use various icon themes, widgets, and shortcodes. It also lets you control the position of the icons. And, of course, the main selling point here is that the icons are always visible on the screen, no matter what part of the page the visitor is reading at the moment. 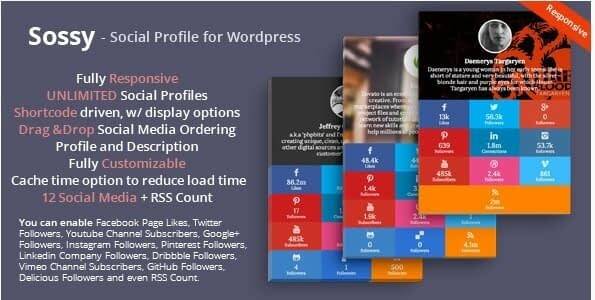 Another one on our list of social media plugins for WordPress is a lightweight plugin that brings you modern and beautiful social media icons. You can add them to your posts, pages, and custom post types. The plugin comes with support for Retina and high resolutions displays. If you prefer simple icons and social links, you might like this one. This is a simple widget that links to your various social media profiles. And it does support many many social networks. You can pretty much assume that whatever social platform you use, this plugin has a button for it. A nice way to promote your profiles and get people to follow you. Sossy brings you all the things you need if you want a dominant social media presence on your site. With it, you can create unlimited social profiles and counters with images, covers, and descriptions. Basically, it lets you manage your social activity very easily and make it visible on your website. 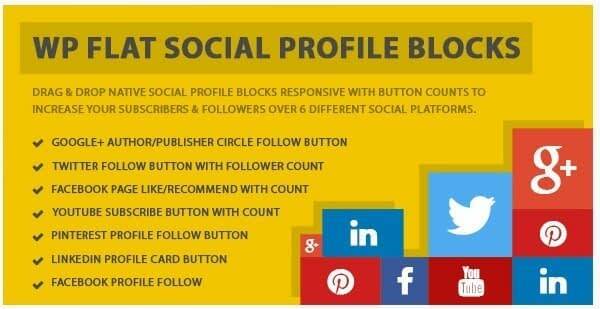 This plugin brings together all the social media streams from all your accounts. You can now control your whole social media activity from one single page. 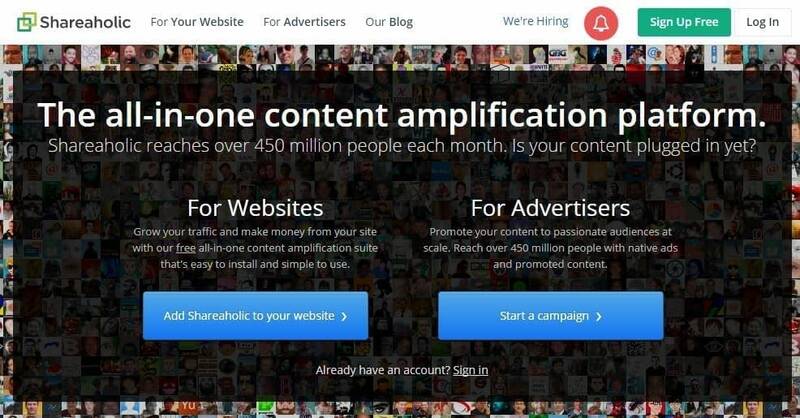 This plugin shows all the posts, shares, comments, likes etc. from any of your channels. Another plugin that comes with modern features, Visual Composer integration (which lets you create your stuff easily by dragging and dropping the elements), lets you pick appropriate designs and re-order the icons. 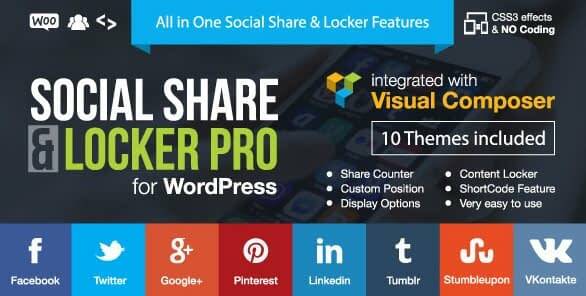 The plugin offers multiple sharing buttons, different display showcases, followers buttons, and social content lockers. A simple plugin that brings you tons of social sharing buttons that you can customize to your liking. Feature-wise, you can track traffic referred by SharePlus with Google Analytics, it provides auto-open share buttons when users are ready to close the page, and lastly, you can choose from five different themes for the icons. 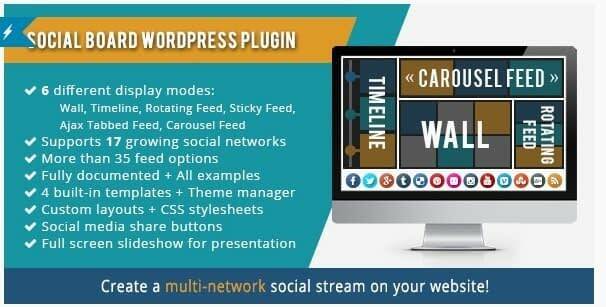 If you want to display multiple social channels in a single social stream on your website, WordPress Social Board plugin lets you do that by providing you with six display modes: wall, timeline, rotating feed, sticky feed, Ajax tabbed feed, and carousel feed. You also get support for 17 social networks, 35 feed options, four built-in templates, and multiple custom layouts. You can call SumoMe a multipurpose plugin, as it does a bit of everything: creates various email subscription forms, simple contact forms, analytics, and, most important of all, it has social media sharing tools. SumoMe helps you add buttons for sharing images and content, and it also comes with Highlighter – a tool through which the visitors can highlight certain excerpts or sections of your articles and share them right away with a click. Shareaholic is a tool for people who “breathe” social media. It was made to increase your page views by providing share buttons, analytics, shareable images, and follow buttons. The plugin also focuses on the monetization side, as it can help you earn consistent revenue from your content through native ads and affiliate links. Here’s a plugin that won’t let your visitors leave your site until they like a page or wait to be redirected. It comes with a visual editor and customization options that you can use to create engaging forms. The plugin also provides pop-ups that show up when users are about to exit the site. Socializator brings you all the necessary features and options to create floating social and email subscription bars. You can customize the bars anyway you want by choosing the colors, backgrounds, icon shapes and order, and the position of the bars on a webpage. A modern plugin that provides you with “follow,” “subscribe,” and “recommend” buttons to be added anywhere on your WordPress site. It comes with intuitive drag-and-drop social profile blocks that you can customize the way you want. There are icons and designs for all the popular social networks. A very interesting example of what social media plugins for WordPress can do. “Pay with a like” is a popular concept these days. And the wpLike2Get plugin gives you exactly this functionality. In a sentence, it allows you to put your downloads behind a like/share wall. An awesome plugin that helps you get traffic by adding prominent mobile-ready share buttons to your pages and posts. 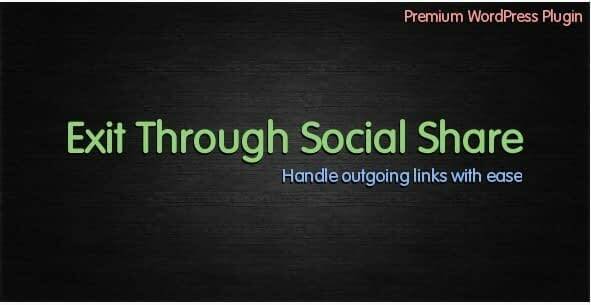 It brings you about 5,000 style combinations for the icons, custom tweets, Pinterest-like images, shareable quotes, Twitter cards, share counts (which can be recovered if you switch permalink structures), analytics integration, and many more great features. Another “pay with a share” plugin. It locks a certain part of the page until the visitor shares it to their followers. 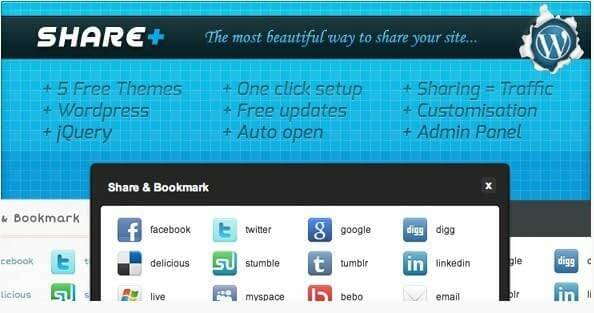 A cool social media plugin that gives you a range of share buttons, along with the AddToAny button. There are follow icons too, which means that you can basically use this plugin as your sole social media integration on WordPress. This is a specific branch of Jetpack’s, which provides you with some very simple and classic social media share buttons. It you want to maintain a professional appearance and prefer simple, elegant icons, the plugin will handle that for you. 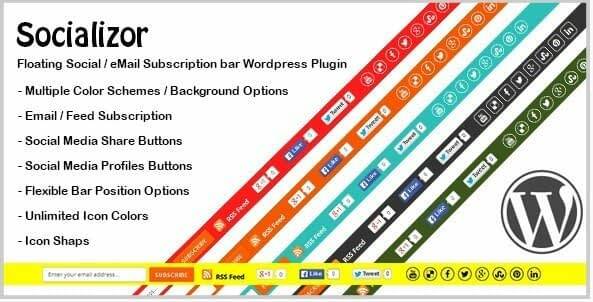 This plugin gives you customizable social media icons, such as RSS, email, and multiple social networks (200+). It also lets you upload your own icons. You can choose from 16 different designs, animations, pop-ups, and more. This plugin lets you create clickable tweet boxes, which allow visitors to tweet a message you have specified in your blog posts or pages. It comes with templates, fonts, animations, and customizable button text. Plus, there are new customizations, additional templates and fonts coming in the future. 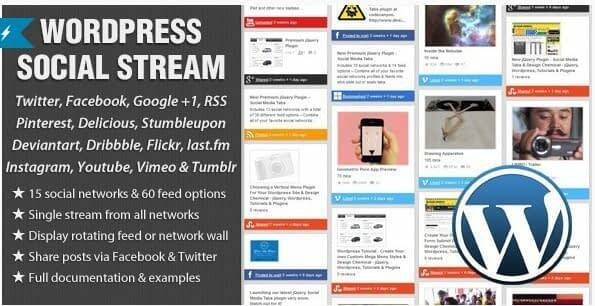 So these are the most interesting social media plugins for WordPress that we could find. Is there anything we missed?